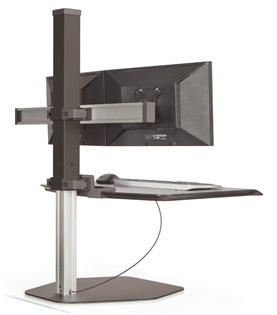 Easy height adjustment - Adjust the height of your sit-stand workstation with just the push of a button. 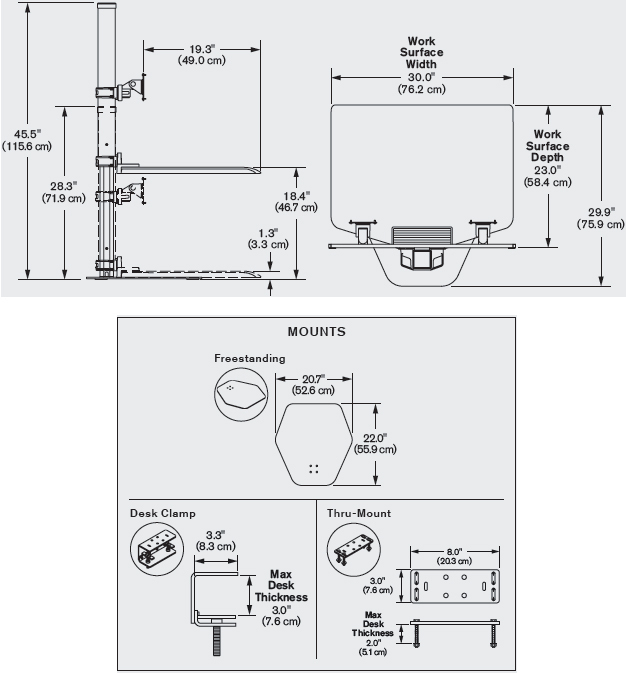 Features 17" of height adjust to accommodate a variety of users. Moving at work for a healthy lifestyle - Ease body pain and boost health by increasing your movement at work. Winston gives you the freedom to easily alternate between sitting and standing throughout the day. Engineered for stability - The industry's first locking cylinder keeps your workspace in place eliminating wobble while you work. Expansive work surface - Large surface feels more like a real desk when standing and allows you to take all of your necessary items with you when you stand. An effective way to stop the health problems associated with sitting for long periods of time is to invest in a freestanding sit/stand workstation. Winston Workstation, Innovative's new sit/stand workstation, has a freestanding base that instantly turns your current desk into a healthy workspace. With a push of a button, users enjoy seamless height adjustment and a locking cylinder to keep the workstation in place. No manual adjustment required. 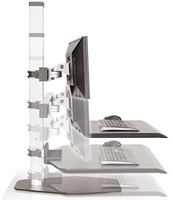 Winston Workstation was engineered for stability allowing for the benefits of standing while working without the distraction of unwanted movement. The workstation also features a large natural wood surface and convenient storage tray, so users can bring all their necessities with them when they go from sitting to standing. With the Winston Workstation, employees can take advantage of standing throughout their day without major interruption to their workflow, helping to make them healthier and more productive. A recent study reveals why Users and Decision Makers choose Winston as the most versatile sit-stand for the workplace. Increasing the amount of standing in your day - even just three hours per day - can offer you the same health benefits as running 10 marathons a year and can extend your life by two years. Standing more also counters all the health concerns too much sitting can bring, including reducing the risk of obesity, type 2 diabetes, cardiovascular disease, and cancer. An effective way to stop the health problems associated with sitting for long periods of time is to invest in a freestanding sit/stand workstation and to take simple steps for a more active workday. Some suggestions include small changes like taking the stairs instead of the elevator, walking to speak with a co-worker instead of emailing or calling, and swapping out your chair for a height adjustable desk to stand during the day. Excessive sitting is associated with a number of chronic diseases and conditions.